A majority of the public (62%) continues to approve of the U.S. military campaign against Islamic militants in Iraq and Syria; fewer (33%) say they disapprove. Support for U.S. military action in Iraq and Syria has held steady over the course of the past year. Comparable majorities of Republicans (66%) and Democrats (65%) support the U.S. military campaign against ISIS. Independents are slightly less likely than partisans to approve of the campaign: 57% say this, while 38% say they disapprove. Support for the U.S. military campaign against Islamic militants in Iraq and Syria extends across those with different preferences for the 2016 Democratic and Republican presidential nominations. Among Republican and Republican-leaning registered voters, about two-thirds of Donald Trump (66%), Ted Cruz (64%) and John Kasich (67%) supporters say they approve of the military campaign against Islamic militants in Iraq and Syria. On the Democratic side, 69% of Democratic and Democratic-leaning registered voters who support Clinton approve of the U.S. military action. A narrower majority of Democratic voters who support Sanders (56%) say they approve of the military campaign. While majorities approve of the U.S. military campaign, most do not think the effort against Islamic militants in Iraq and Syria is going well at present. About six-in-ten (58%) say the campaign is going not too or not at all well, compared with just 38% who say it is going very or fairly well. Assessments of the campaign are particularly negative among Republicans. Nearly seven-in-ten (68%) say the U.S. effort is not going well. Majorities of Cruz (75%), Kasich (67%) and Trump (66%) supporters have negative impressions of the current state of the campaign. By contrast, Democratic views of the current state of U.S. efforts against Islamic militants in Iraq and Syria are mixed. About as many say the campaign is going very or fairly well (48%) as say it is going not too or not at all well (46%). But there are key differences within the Democratic voters by candidate preference on this question. Among Clinton supporters more say the effort is going well than not well by a 57%-38% margin. By contrast, most Sanders supporters (62%) say things are going not too or not at all well, while just 33% say things are going very or fairly well. When it comes to the public’s greater concern about U.S. military action in Iraq and Syria, somewhat more continue to say their greater concern is that the U.S will not go far enough to stop the militants (50%) than say their greater concern is that the U.S. will go too far getting involved in the situation (43%). Republicans are much more concerned that the U.S. will not go far enough to stop the militants (74%) than that it will get too involved in the situation (23%). The balance of opinion among Democrats is the reverse: 57% say their bigger concern about military action in Iraq and Syria is that the U.S. will go too far getting involved in the situation, compared with just 35% who are more concerned the U.S. won’t do enough to stop the militants. Independents overall are split (47% worry the U.S. will not go far enough, while 46% worry it will go too far), but those who lean toward a party express views similar to those of straight partisans. By a wide 68%-28% margin, Democratic supporters of Sanders are more concerned the U.S. will go too far in getting involved in the situation in Iraq and Syria than that it will not go far enough to stop the militants. Clinton supporters also express more concern about the U.S. getting too involved in the situation, but by a less one-sided 53%-40% margin. Among Republican voters, similar majorities of Cruz (77%), Kasich (73%) and Trump (71%) supporters say their greater concern about military action in Iraq and Syria is that the U.S. will not go far enough to stop Islamic militants there. In addition to wide partisan divides, there are large differences on this question across age groups, with younger adults more likely to express concern about the U.S. getting too involved in Iraq and Syria and older adults more likely to express concern about the U.S. not going far enough to stop Islamic militants. For example, by a 57%-38% margin, adults ages 18-29 say their greater concern is the U.S. getting too involved in the situation; by contrast, adults ages 65 and older are more concerned the U.S. will not go far enough to stop the militants (61%-33%). The public is divided over whether the U.S. should send ground troops to fight Islamic militants in Iraq and Syria: 46% favor this, while 50% are opposed. Views are little changed over the course of the past year. Nearly seven-in-ten Republicans (68%) favor sending ground troops to fight ISIS in Iraq and Syria; 72% of conservative Republicans say this, compared with somewhat fewer (58%) moderate and liberal Republicans. By a 65%-31% margin, Democrats are broadly opposed to sending U.S. ground troops to fight in Iraq and Syria. Liberal Democrats oppose using U.S. ground troops by a wide 75%-21% margin. Among conservative and moderate Democrats, opposition outweighs support by 57%-41%. A 60% majority of young adults (those 18-29) oppose sending U.S. ground troops to Iraq and Syria. Older groups are more divided: For example, among those 65 and older, 48% favor sending U.S. ground troops to fight Islamic militants, while 44% are opposed. Those with higher levels of education are less likely to support ground troops than those with less education. More adults with postgraduate degrees oppose than favor sending troops (59% vs. 37%). By contrast, those with no more than a high school degree are more split (50% favor, 46% oppose). Currently, 54% say the U.S. government is doing very or fairly well reducing the threat of terrorism, compared with 45% who say it is doing not too or not at all well. The share giving the government positive ratings is up eight points from December, when assessments of the government’s job performance hit a post-9/11 low in the wake of the Paris and San Bernardino terrorist attacks. Just 29% of Republicans say the government is doing very or fairly well reducing the threat of terrorism, compared with 75% of Democrats. The current 46-point gap between the views of Republicans and Democrats is wider than it was at in early 2015 (22 points), when overall ratings of the government’s performance reducing the terror threat were more positive. Independents’ views of the job the government is doing reducing the terror threat are mixed: 51% say it is doing very or fairly well, while 47% say it is doing not too or not at all well. By a 50%-35% margin, more say their greater concern about the government’s anti-terror policies is that they have not gone far enough to adequately protect the country than say they have gone too far in restricting the average person’s civil liberties. Since December, shortly after terrorist attacks in Paris and San Bernardino, the share expressing greater concern that government policies do not go far enough has declined six points, while the share saying they are more concerned about civil liberty restrictions has increased seven points. A majority of Republicans (64%) say they are more concerned that government policies have not gone far enough to protect the country; just 23% are more concerned about civil-liberties restrictions. Democrats and independents hold more mixed views: 46% of Democrats and 47% of independents say their greater concern is that government policies have not gone far enough to adequately project the country, while about four-in-ten of both groups (40% of Democrats, 39% of independents) say they are more concerned that government policies have gone too far restricting the average person’s civil liberties. Supporters of Clinton are somewhat more likely to say government anti-terror polices have not gone far enough to protect the country (51%), than say they have gone too far restricting the average person’s civil liberties (35%). Among Sanders supporters, the balance of opinion is reversed: 51% say policies have gone too far in restricting civil liberties, while 33% are more concerned that policies have not gone far enough to protect the country. Within the GOP, there are no significant differences in these views by primary candidate preference. 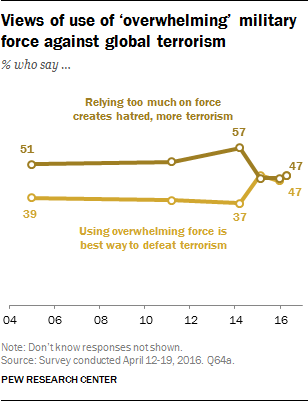 When it comes to the best approach for dealing with global terrorism, as many say that using overwhelming military force is the best way to defeat terrorism around the world (47%) as say that relying too much on military force to defeat terrorism creates hatred that leads to more terrorism (47%). These views have changed little over the course of the past year. However, in 2014 – before ISIS registered widely as a security threat with the public – more said relying too much on military force created hatred and more terrorism than said that it is was the best way to defeat terrorism around the world. There continue to be wide partisan gaps over the use of overwhelming force to confront terrorism. Fully 70% of Republicans say military force is the best approach to defeating global terrorism, compared with just 24% who say it does more to create hatred and lead to further terrorism. Conservative Republicans (77%) are more likely than liberal and moderate Republicans (56%) to take this view. By contrast, 65% of Democrats say relying too much on military force to defeat terrorism creates hatred that leads to more terrorism, while only 31% see it as the best way to defeat terrorism around the world. Liberal Democrats take this view by a much more one-sided margin (77%-19%) than conservative and moderate Democrats (56%-41%).